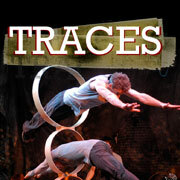 If you live in Charlotte, you quite simply MUST go see “Traces” at the McGlohon Theatre. Several of us went to go see the show on Friday night as part of Danny’s “Out on the Town” group with the Blumenthal Performing Arts Center. The reception itself was fun, but the turn-out wasn’t great — mostly the group of friends that I got to come. Still, food and drinks were good, the company was magnificent, and it was all free! But it was nothing compared to the performance itself. To give you an idea of what the show is like, consider that its marketing compares it to both “Cirque du Soleil” and “STOMP.” That’s accurate — it reminded me of both shows. There are acrobatic maneuvers that leave you breathless, and creative ways of making sound with movement and everyday items. But that really doesn’t BEGIN to describe how beautiful the performance is. Despite it’s thematic similarities to those well-known shows, it was incredibly unique. It was breathtaking. I found myself grinning like a fool, clasping my hands to my chest and my face, laughing and clapping like a kid at a puppet show. I was awestruck by the beauty of it all. And that’s not even counting the excitement and the thrill of the final act, a series of leaps and tumbles through an ever-growing collection of Chinese hoops. There was a story involved, I’m sure — but I didn’t really get it. Frankly, the only reason I even knew about the story was because I read a review on the performance prior to seeing it. I say skip the idea of a story altogether, and just focus on the music, the energy from the crowd, the unbelievable talent from the performers. Enjoy the playfulness they all exhibit, the romance that Will and Héloïse share, the camaraderie that brothers Francisco and Raphael share, the protectiveness that Brad shows during dangerous acts… These five performers will stun and delight you, if you let them. “Traces” runs through November 16th, in Spirit Square. If anyone wants a friend to sit with, let me know — I’d go a dozen more times if I could. This entry was posted on Tuesday, October 21st, 2008 at 7:22 pm and is filed under Uncategorized. You can follow any responses to this entry through the RSS 2.0 feed. You can leave a response, or trackback from your own site.